“It’s easy—maybe a little too easy,” I told the crowd of Barbecue University students gathered around the first wood pellet grill many had seen. People nodded—we had an understanding, right? Smoking and barbecuing are supposed to be hard work. If not chopping wood, then at least breathing in charcoal dust and smoke and laboring to maintain a steady temperature during a barbecue session that could last the better part of a day. Or night. Certainly no self-respecting pit master would subscribe to a “set it and forget it” philosophy. Pellet grills are a fad, I thought to myself, that will flame out fast. Today, the Hearth, Patio and Barbecue Association (HPBA) reports that wood pellet grills are one of the hottest trends in the industry, offering consumers the primal flavor of wood smoke coupled with the turn-of-a-knob convenience of gas. Roughly 300,000 units were sold last year—less than 2 percent of total grill sales—but the popularity of pellet grills is surging. It looks like I’m forced to eat crow—which, who knows, might even come out palatable if smoke-roasted on a pellet grill. What are pellet grills? Picture a classic offset barrel smoker with a side-mounted hopper replacing the firebox. Or what looks like a stainless steel supergrill with the hopper in the back. You fuel it with cylindrical food-grade wood pellets—each about an inch long and 1/4-inch wide—composed of compressed hardwood sawdust. The sawdust is subjected to high pressure and heat, which activates lignin—a natural glue in wood. With the exception of vegetable oils to aid the extrusion process or carry flavor, the pellets contain no additives. They burn cleanly, leaving remarkably little ash. Pellet grills run on standard household electrical current. When you plug the grill in and turn on the digital controller, a rotating auger delivers pellets from the hopper to a cylindrical fire pot housing an igniter rod. The rod glows red hot for several minutes, igniting the pellets. Heat and smoke from the combusting pellets are diffused by a continuously-running blower fan as well as metal plates under the grill grate. One model, the upscale Memphis Wood Fire Grill, lets you both smoke and direct grill over a wood pellet fire. Pellet grills are versatile. You can barbecue, smoke, roast, grill (sort of—more on that below), and even bake or braise in a pellet grill. At BBQ University, we have used them to cook everything from crisp chicken wings to braised short ribs to smoked pork chile verde and crème brulee. Like gas grills, pellet grills preheat fast (10 to 15 minutes). The design discourages flare-ups. 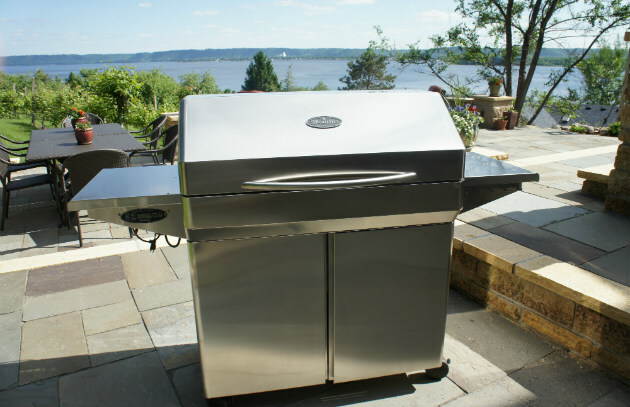 Some pellet grills allow you to regulate temperatures in 5-degree increments, giving you pinpoint heat control. A thermostat in the cooking chamber sends precise signals to the controller and regulates pellet delivery. Because a pellet grill works like a convection oven, you can load up the cook chamber without fear of uneven cooking. You don’t normally over-smoke food on a pellet grill. The smoke flavor is more subtle than the sometimes acrid smoke generated by a straight wood or charcoal fire. The grills are available in a number of sizes from small to large, as well as commercial-size units that can accommodate a whole hog or pulled pork for a crowd. For additional wood smoke flavor, you can position hardwood chunks or pouches of soaked wood chips directly on the heat diffuser plate. Pellets come in a variety of flavors—hickory, pecan, alder, mesquite, cherry, apple, maple, bourbon, etc., and can be mixed or changed in minutes. One 20-pound bag is sufficient for several cooks, though usage will depend on the temperature setting and weather conditions (wind and cold will increase pellet consumption). Under normal circumstances, a pellet grill will use about 1/2 pound of pellets per hour on the smoke setting and 2-1/2 pounds on high. Some companies offer cold smokers as an accessory—perfect for Nova Scotia-style salmon or cheese. Pellet grills are dependent on electricity, limiting their portability unless you have access to a generator or inverter. Though they are marketed as “grills,” you won’t get grill marks or a dark sear, as the units run on fan-driven indirect heat. In my opinion, these are smokers—not grills. You can increase the amount of caramelization you get on the outside of food by preheating a cast iron grill grate, skillet, griddle, or plancha directly on the grill grate for 20 minutes before cooking. Pellet grills are relatively expensive, retailing from a few hundred dollars to more than $4000. The higher the cooking temperature, the less smoke the unit generates. 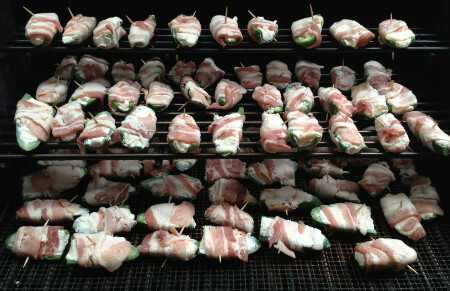 You’ll get the most smoke flavor at temperatures below 250 degrees. Any grills with moving parts and electrical components can break down (a risk not associated with charcoal or wood grills). If exposed to moisture, pellet fuels will disintegrate. People who live in humid climates must keep their pellets dry, preferably indoors in airtight lidded containers. The bottom line? We now have several pellet grills at Barbecue University and some students love them. Of course, there are still a lot of purists (or masochists) out there who insist on burning charcoal or wood. 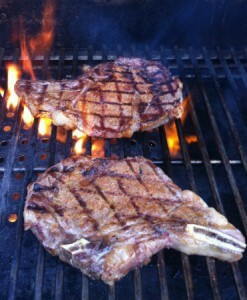 ** Memphis Wood Fire Grills: Stylish design, sophisticated electronics, and great thermodynamics. This is one of the few pellet grills that lets you remove the top of the burn chamber so you can direct grill over a wood pellet fire. Rec Tec: In business for about 5 years, Rec Tec manufactures a pellet grill with 680 square inches of cooking space. Temperatures can be calibrated in 5-degree increments, and the pellet hopper holds up to 40 pounds of pellets. Current price of the smoker is $1000. FireCraft: Made in the USA, the awesome FireCraft Pellet-Q450 Pellet Grill sells for about $900 and allows for both direct and indirect grilling. It also includes a trademarked “Pellet Exchange” feature, giving you the ability to quickly switch out pellet flavors. MAK Grills: Sells four American-made pellet grill models, from the 1-Star General ($1600) to the 4-Star General ($8000). The trademarked “FlameZone” attains temperatures of 500 degrees and can be used for direct grilling. Traeger Pellet Grills: Traeger launched the pellet grill revolution and has a large following for its affordably priced grills (starting at $300).